Sacrifice is a part of life. It’s supposed to be. It’s not something to regret. It’s something to aspire to. Death ends a life, not a relationship. Sometimes when you sacrifice something precious, you’re not really losing it. You’re just passing it on to someone else. When you look into your mother’s eyes, you know that is the purest love you can find on this earth. What is it about childhood that never lets you go, even when you’re so wrecked it’s hard to believe you ever were a child? Sticking with your family is what makes it a family. Holding anger is a poison…It eats you from inside…We think that by hating someone we hurt them…But hatred is a curved blade…and the harm we do to others…we also do to ourselves. All parents damage their children. It cannot be helped. Youth, like pristine glass, absorbs the prints of its handlers. Some parents smudge, others crack, a few shatter childhoods completely into jagged little pieces, beyond repair. Holding on to things only breaks your heart. Try to imagine a life without timekeeping. You probably can’t. You know the month, the year, the day of the week. There is a clock on your wall or the dashboard of your car. You have a schedule, a calendar, a time for dinner or a movie. Yet all around you, timekeeping is ignored. Birds are not late. A dog does not check its watch. Deer do not fret over passing birthdays. an alone measures time. Man alone chimes the hour. And, because of this, man alone suffers a paralyzing fear that no other creature endures. A fear of time running out. 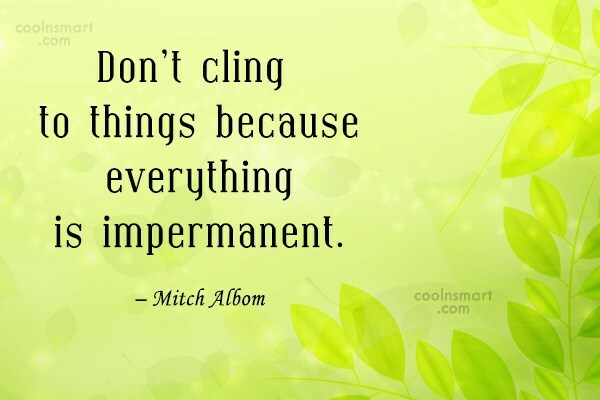 Don’t cling to things because everything is impermanent. Don’t let go too soon, but don’t hold on too long. The truth is, once you learn how to die, you learn how to live. Without love we all like birds with broken wings. When you are measuring life, you are not living it. People are only mean when they are threatened. The secret to happiness…be satisfied and be grateful. “Everyone knows they’re going to die”, he said again, “but nobody believes it. If we did, we would do things differently”. Love wins, love always wins. Heaven can be found in the most unlikely corners. I also believe that parents, if they love you, will hold you up safely, above their swirling waters, and sometimes that means you’ll never know what they endured, and you may treat them unkindly, in a way you otherwise wouldn’t. Nothing haunts us like the things we don’t say. Accept who you are; and revel in it. So many people walk around with a meaningless life. They seem half-asleep, even when they’re busy doing things they think are important. This is because they’re chasing the wrong things. The way you get meaning into your life is to devote yourself to loving others, devote yourself to your community around you, and devote yourself to creating something that gives you purpose and meaning. Have you ever lost someone you love and wanted one more conversation, one more chance to make up for the time when you thought they would be here forever? If so, then you know you can go your whole life collecting days, and none will outweigh the one you wish you had back. Lost love is still love. It takes a different form, that’s all. You can’t see their smile or bring them food or tousle their hair or move them around a dance floor. But when those senses weaken another heightens. Memory. Memory becomes your partner. You nurture it. You hold it. You dance with it. When someone is in your heart, they’re never truly gone. They can come back to you, even at unlikely times. It’s not contagious, you know. Death is as natural as life. It’s part of the deal we made. Love is how you stay alive, even after you are gone. That’s what Heaven is. You get to make sense of your yesterdays.